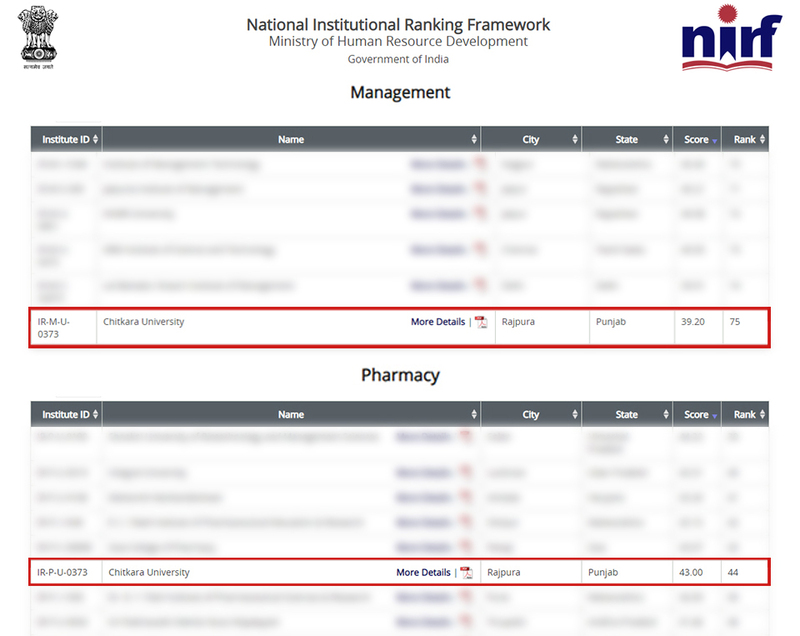 We are delighted to share the news that Chitkara University programs have once again been ranked among the Nation’s Best in the 2019 NIRF India Ranking. In Management, Chitkara University has been Ranked 75th among 555 Management Institutions, with scores of TLR 56.05 (100); RPC 4.31 (100); GO 67.89 (100); OI 69.42 (100); PERCEPTION 5.83 (100). In Pharmacy, Chitkara University has been Ranked 44th among 301 Pharmacy Colleges and Universities, with scores of TLR 63.21 (100); RPC 16.16 (100); GO 54.11 (100); OI 57.59 (100); PERCEPTION 26.10 (100). The National Institutional Ranking Framework (NIRF) is approved by the MHRD and was launched by Hon’ble Minister of Human Resource Development in 2015. The methodology to rank institutions across the country draws inputs from the overall recommendations, broad understanding arrived at by a Core Committee set up by MHRD, to identify the broad parameters for ranking various universities and institutions. The parameters broadly cover ‘Teaching, Learning and Resources’, ‘Research and Professional Practices’, ‘Graduation Outcomes’, ‘Outreach and Inclusivity’, and ‘Perception’. The ‘Teaching, Learning & Resources (TLR)’ component metrics is based on – Student Strength including Doctoral Students, Faculty-student ratio with emphasis on permanent faculty, Combined metric for Faculty with PhD (or equivalent) and Experience (FQE), and Financial Resources and their Utilisation (FRU). These parameters are related to the core activities of any place of learning. The ‘Research and Professional Practice (RP)’ component metrics is based on – Combined metric for Publications, Combined metric for Quality of Publications (QP), IPR and Patents: Filed, Published, Granted and Licensed (IPR), and Footprint of Projects, Professional Practice and Executive Development Programs (FPPP). Excellence in teaching and learning is closely associated with the scholarship. The ‘Graduation Outcomes’ component metrics are based on – Combined metric for Placement, Higher Studies, and Entrepreneurship (GPHE), Metric for University Examinations(GUE), Median Salary (GMS), Metric for Graduating Students Admitted Into Top Universities, and Metric for Number of PhD Students Graduated (GPHD). This parameter forms the ultimate test of the effectiveness of the core teaching/learning. RD), Percentage of Women (Women Diversity WD), Economically and Socially Challenged Students (ESCS), and Facilities for Physically Challenged Students (PCS). The Ranking framework lays special emphasis on the representation of women. The ‘Perception (PR)’ component metrics is based on – Peer Perception: Employers and Research Investors (PREMP), Peer Perception: Academic Peers (PRACD), Public Perception (PRPUB), and Competitiveness (PRCMP). The ranking methodology gives significant importance to the perception of the institution.